I absolutely looooveeee Christmas stories ? I love Christmas romances, the perfect time for love. I cannot wait to read this book. I have enjoyed the Westcott series so much, and I look forward to reading “Someone to Trust.” In anticipation of its release, I’ve started reading the entire series all over again. Christmas stories are one of my indulgences during the craziness of the holiday preparation. Thanks for writing such wonderful stories about flawed heroes and heroines! Your Christmas stories have a certain charm that brings a special warmth to the characters and plot. I love that. I look forward eagerly to the release of “Someone to Trust.” I am currently re-reading the Westcott series in preparation. Love Christmas and other holiday stories. They make a little teary eyed but well worth the read. I’m not normally a big fan of novellas, but I love your Christmas stories. I have all of the books that you mentioned above. THE BEST GIFT is my favorite of the novellas. I love Christmas. I love your books, and I would dearly love to have an advanced copy of SOMEONE TO TRUST. I’m so looking forward to its release. Can hardly wait to read Elizabeth’ story! I’ve been waiting to learn more about her past and future since Anna Snow walked into the family gathering in SOMEONE to LOVE! I just love Christmas themed books. They really put in the Holiday Sprite ! Thanks Mary for a chance to enter! Just finished Someone to Care. Can’t wait to read this one! I love Christmas stories & always keep my eye out for yours – I’ve got a stack of some of the older anthologies that are keepers. I love to find out the connections between books & catch up with the characters from earlier stories. Love the Wescott series and admit to being obsessed with Regency Christmas stories. Hope to win the last advance reading copy of the next installment! Usually the first week of November my Sister and I start our annual search for Christmas novels. The Story can be new or an old favourite, there’s just so much comfort in the idea of a wonderful Christmas romance. I have been fortunate enough to find copies of some of the older Signet anthologies. I agree – Christmas can be an equivalent of a warm and wonderful character in a story. Thanks for all the Christmas love you have shared with us. I’ve always enjoyed Christmas themed novels and stock up each year. Would love to get a copy of your upcoming release! I always enjoy your books—and the Christmas stories. Thank you for your Christmas stories, Mary. I just finished “Christmas Miracles” while on vacation and it was exactly what I needed to be warmed with the thoughts of home and family. I love all of your books and can’t wait to read this one. I love your Christmas stories, and am really enjoying the Westcott series! I love the old Cygnet Christmas novella collections and I have all of them still. I’m happy that some of the stories are getting back into print for a new audience. 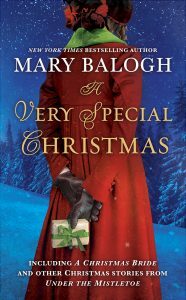 I just started reading “A Very Special Christmas” last night! (Late night – who needs sleep when you have a Mary Balogh book?!). Can’t wait for your newest Westcott novel! I love this series – can’t wait to read this one! Thanks for the chance to win it!! I would love a copy. Thank you for the chance. I’ve always loved your Christmas stories. I love how your heroines are doing things so differently in this series. Can’t wait to read Elizabeth’s story. Love that you are exploring relationships that do not fit the ” norm” of romance books. Can’t wait to read Elizabeth’s story. Love your books, and eagerly await publication of “Someone to Trust”! I adore Regency set Christmas stories and always looked forward to the Signet release each year. The covers were always ones that could put me into a holiday mood. Christmas love stories are quite possibly my favorite type. It is the season when anything is possible and people are at their best. I look forward tot he new release. Love your books and the Christmas ones are so nice. I would love to read this story. Thank you for offering this opportunity! What i like about your Christmas stories is that they sometimes leave you close to tears but are never soppy. Your Christmas story ‘The Best Gift’ is my favorite Christmas story ever, by anybody (I keep it within reach all year for when I need a little love and hope).?? I am waiting with my heart in my throat. So. looking forward to reading this book. Love the blog thing! ? I am always excited when I see that you have a new book. I would love to add this one to my collection, so that I can read it over and over again. Love your books! I find myself always eagerly awaiting the next one. Thanks for this chance to get it early. I love all your books, can’t wait to read your latest! Still trying to fill in my collection with the few I’ve missed. And love the fact that you like Georgette Heyer, she was the first romance writer I read, and I still love going back and re-reading her (and your) books! I would love a copy of this to read. I know that i’ll read it, but receiving one from you would be such a heart-warming way to start the Christmas season!!! L9ve your books! It’s so nice to find out more about the characters as the series grows. The Christmas stories are always so nice to read, especially on the cold winter evenings. Thanks and looking forward to your next literary adventure (s). Thanks again for a chance to win one of your reading copies! I truly adore your Christmas novels and novellas. You capture the warmth and spirit of the season so well with your writing and it is wonderful to be whisked back to a time when many Christmas traditions began. My favourite stories are about the lonely finding love at last. I am looking forward to reading Someone to Trust – it is already on order! I love them all! Can’t wait! I can’t wait for the next book in the Wescott series. It is one of my favorites! You are such a talented author! I love Christmas stories and you are my favorite HR writer. Can’t wait to read “Someone to Trust”! Love your posts. They bring out the romance, joy, entertainment , fun and fulfilment of reading! Not sure if this is the blog, but my wife thoroughly enjoys the Christmas holidays, music, movies and literature of this special time of year. Thank you. As a retired Lit. Teacher I appreciate all that you do to make reading so pleasurable experience. I have enjoyed the Wesrcott series and look forward to each new installment. Still love the Bedwyns too. You are the only author that I reread. They are all just as good the second time around. So enjoy your Christmas stories. I am happy to read any of your books. You are one of my top favorites! Thanks for the opportunity! Someone to Trust, will provide me some sweet Mary Balogh bonding time with her wonderful characters. My mother got me hooked and I keep up the tradition. All in the family! Love all your Christmas stories I have read to date. It is a wonderful time of year for us all. The SOMEONE TO series is one of your best! I’d love a copy of SOMEONE TO TRUST. Always enjoy Christmas stories. Thank you. I just love reading about all the old traditions – kissing bow, caroling, yule log, mistletoe. I’m from a warm climate and I miss out on many of the traditionally Christmas festivities. I usually read Christmas stories from Thanksgiving until New Years. Would love to win this. Thank you. I would be honored to win a copy of your book. I would love a copy of the book “Someone to Trust” for my mother in law, who is 82 and loves to read. I predict she’ll get hooked on your books! Thank you in advance for the chance to get her started reading your books! Christmas stories are wonderful and I love your perception of them! I’m an avid reader of your books though by no means have I read them all yet! Reading your ‘About Mary’ page was incredibly inspiring as I’m an aspiring author and hope to fully realize that dream in the next few years now that my youngest has begun Kindergarten. I live in Smithers, British Columbia and hope to one day use it as a historical romance setting. Loved the Regency Christmas series – I have most of them. Wonderful stories. Your Christmas stories are wonderful. Can’t wait to read Someone to Trust. Elizabeth is such a great character. Loved her in the first book, each of your series have you wait with such anticipation for the next story. I do enjoy your Christmas Stories, but of course I enjoy all your stories. I always feel that your books are like a present to myself – so enjoyable, so gentle and interesting, and i am almost unable to put them down until I finish. Of course when I have finished I can’t wait until the next book. Thank you. Love all the books that you have written. Christmas stories have always held a special place with me. As a child, my sister and I were always given a book to open on Christmas Eve which we read before bed. This is a tradition I’ve carried on with my boys. They each get a Christmas themed book we read before bed then off to bed so mom can read her Christmas romance. Excitedly waiting Someone to Trust; what could be better than the Westcott’s at Christmas season?As a clergy family, our focus is firmly on the non-commercial celebrations during the holidays. I know this is why, during MY busyness,I escape to join an earlier era to recharge and relax with a good HR book! Just received A Very Special Christmas and would love to receive this book. Also, I am a fan of the philosophy your lead characters exemplify. I was hoping there would be new stories in your Christmas collection, so am excited to hear your next book includes Christmas! I think I have all of your Christmas books and novellas and they have been reread many times! Just like classic Christmas movies, they are part of my traditions. I have not kept any others! Your blog here tells me why ! I love Christmas stories. It is such a magical time of year. I am really enjoying the Westcott series. I can’t wait for the next book! Would love to win this book! Love all of your characters. My favorite Christmas story of yours is Christmas Beau! I’ve read all of your books and have enjoyed all of them. I look forward to reading your newest one. Love all of your books Mary! I finished Someone to Care yesterday. I am definitely looking forward to reading the next instalment in the Westport series! I am anxiously awaiting book five, Someone to Trust! Looking forward to another of your books. Hello Mary! I am possibly one of your very first fans. My mother introduced me to Signet regency romances around 1972. Every single year, my older sister and my mother and I would look forward to Signet publishing their Christmas anthology with so much excitement! I have collected every single paperback copy of every Signet Christmas anthology – your stories were absolutely my favorites. I can’t tell you how much enjoyment those stories have given me over the years. I also have purchased the e-copies of every single one of these Christmas anthology stories. I would dearly love to get the jump on everybody else and read this book before it comes out! Christmas is that special time of year for magic! Looking forward to your next book! I can’t wait for the next story for this interesting family! Thinking of my mother now as this was a time to buy a Regency Christmas Anthology. The delicious joy was to read a beautiful love story set in a time where conversation could be pithy yet traditions were memorable and signaled renewed hope. I would love to read Someone To Trust. I so enjoy your characters’ lives! Thanks for the opportunity to win this book! I loved Christmas Bride such a good turn around of a difficult character. I have all your Christmas stories. I have been a fan for a long time. I am looking forward to Someone to Trust. I have long been waiting to read Elizabeth’s story. And seeing as November 27 is my birthday, it will be the perfect present that I will get for myself. A Christmas Promise was the very first of your books that I read. At bedtime, and luckily I did not have to work the next day…as I read it all that night. I noticed that, unlike many holiday themed novels and movies, Christmas was woven into the setting, the spirit and the resolution of the story. One of my favorites. Looking forward to Elizabeth’s story. Loving this series, can’t wait to read Elizabeth’s story. She’s such a kind considerate person, so it will be nice for her to get her happy ending too. Me! Pick me! I have so much admiration for your writing, Mary and I really like your Christmas stories. It can be a hectic time of year, but your stories give me a bit of peace. Healthyvdistraction from family holiday drama at least. I just reread all the books to ready for this ones release! Can’t wait! I love your Christmas stories. I think The Wassail Bowl was my favorite. The story of Edgar and Helena was lovely. The (A?) Chiristmas Promise was also a fantastic story of love and Christmas (and like A Christmas Bride mixed the nobility and the merchant class). Writing a short story with fleshed out characters is difficult, but you manage to do so very well. I wish you would do one again. I re-read the Christmas story collections every year. My copies are just a wee bit “worn” but well-loved. I always look forward to your next new book as it is released. Thanks for the new Christmas tale! I love anthologies, especially Christmas stories. I am so pleased to have an opportunity to win Elizabeth’s story. Thank you very much! I am so looking forward to this book! Thanks for the chance to win. Good series, can’t wait for the next book! I would love to win this Christmas story. I have enjoyed the others immensely. Always loved your Christmas tales. Apart from the beauty of love and family happiness in the time when there’s only a dreary landscape outside, I also love your description of the Christmas bride with her fur-caped wedding dress, and she signifies all the warmth and beauty and the coming spring after winter. await each new instalment. Keep ’em coming. Diolch yn fawr iawn! Slowly catching up on your books. Hours of great reading. Thanks! Christmas Bride was great, I read it a long time ago, I live getting your novels on audible and listening wile I do housework but I’d love a copy to give to my sister. I love Christmas!!! Love is everywhere. Hope and joy are in the air and everything looks amazing!!! Christmas stories are always full of redemption, forgiveness and of course…love. Stories set at Christmas time have always been a favourite of mine, partially because Christmas is my favourite time of year. I look forward to reading the next instalment in this series. Thanks for the opportunity to win a copy. I love your Christmas stories! Can’t wait to read this one! Mary, I love all your stories. Looking forwarding to a new holiday romance. Dear Mary, thank you for these beautiful insights into your writing process. I love the concept of treating Christmas as an integral part of the story, an element that plays a vital part in the development of the characters and their relationships. I have been following the Westcott family saga, and related branches over the years and re-reading each story almost as soon as I put it down to squeeze a little extra reading pleasure from each character’s transformation. I would be honoured to receive a copy of Someone to Trust if chosen. Thanks so much for creating these beautiful tapestries of life and love rich in history and hope. I don’t need a copy of the book (I will get it as an ebook from the library) but I wanted to comment and say that your Christmas romances are my most favorites. I read them year-round when I need to go to a “happy place.” Your characters always have a beautiful, glowing change of heart and learn to create happiness where they had none before – like in A Christmas Bride, which I just re-read a few weeks ago, when Helena decides to let go of the old hurts which she has lived with for so long. It’s just that time of year! And family is always around, and music, and decorations, and parties, and love. There are many Christmas romances out there, and I have read a truckful, but yours occupy a special, peaceful, snowy cabin in my heart. Thank you. I have never read your books before, so I would love to try one. I’m always looking for new authors to try. Can’t wait to read your new story! I love your Christmas books very much, they are the most touching and beautiful stories I have ever read! If I were a millionaire, -I always tell my friends- I would be keen to sponsor these Christmas stories in TV series so everyone knows them. I’m sure everyone would love and your Christmas stories would turn many families’ Christmas day better. No one writes a Christmas story as well as you, dear Mary, and I wish you to keep writing them. I love Edgar and Helena’s novels, it was a complex and well-constructed story and the couple has a lot of chemistry. And I loved seeing Gerald and Pris conquering friends and social life after all (I cried a lot at the time). About the novellas of Christmas anthology: The Best gift and Playin house are my favorites in this selection, although I have enjoyed them all! My favorites are in Christmas Miracles and Christmas gift, but in general I find all yours Christmas novellas fantastic! I can’t waite to read Someone to trust! 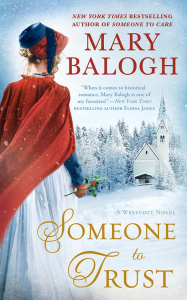 Nothing better than a new book in a Mary Balogh series…I treasure her books and love to go back and reread, especially right before a new one is published! I’m so excited to read Elizabeth’s story soon, and I’m more so knowing now that it will start at Christmas. I really enjoy all of your work! I have loved your Christmas novellas and novels. I simply adore them specially Playing House. Hope to read many more to come. Keep writing Mary we LOVE it! My 100-year-old mother, my two sisters, and I adore your books, especially the Christmas ones which litter our Keepers Shelves. Thank you.